1. Old Salem Church site, corner Rt. 910 & Pearce Mill Road – This, the Pearce family Methodist church, was relocated west to Wexford, closer to rail transportation, in 1924. 2. Cross Roads Cemetery, Rt. 910 north and east of the park – five generations of the Pearce, Austen, Moon and other of our families are buried here. The Presbyterian church, established in 1826, was relocated east in 1974. 3. Marshall Island, old mill pond – both Ralph Pearce (1917-2002) and son Larry proposed to their wives on the narrow bridge leading to this nature preserve. 4. Pearce Family homestead & mill (1820-1917) – birthplace of three generations of Pearces, including Ralph, now Administration Building for the park. 5. Pearce Grove – on original Pearce farm property, just below the Administration Building. 6. School House Grove – on the foundation of one-room Walters School where many of the Pearces attended elementary school. 7. Flagstaff Hill – at the base of which sits Walters School site & beyond which is Guyton Cemetery, where Henry and Sarah are believed to be buried. 8. Moon Grove – site of Moon family homestead & farm. 9. Henry Moon Tavern & Inn, Babcock Blvd. – foundation of what is believed to be an original area settlement established by our patriarch. 10. Allegheny County Memorial Park, Duncan Ave. – Established in 1929, this bucolic 100-acre site contains the final resting places of Pearces, Hills, and others. 11. Joseph & Alice Moon Hill Homestead, Babcock Blvd. – One of four farms believed to have been provided by Capt. John Dixon Hill to his sons after the Civil War. * This tour, whether real or virtual, is designed to begin at the corner of Rt. 910 & Pearce Mill Road and travel EITHER east then south on Babcock to the Park OR south along Pearce Mill Road, stopping at the various sites before completing the circle. For additional information and photos, see the “Table of Contents” for each Pearce-associated family at E-gen.info and/or the “Friends of North Park” Facebook page. 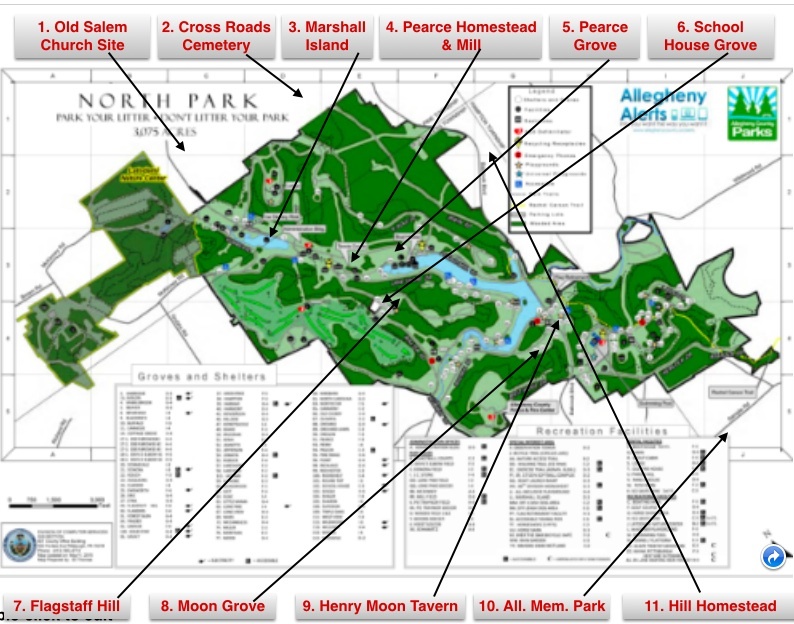 Various maps of the park are available at the Administration Building or by Googling “North Park Allegheny Co PA map.” If you take our tour, we’d like to get your impressions in the inquiries box below or by e-mail, and we will share them with our readers.